I was hoping after some time apart Toby and Kelly would end up back together in a much bigger Flight Cage . That isn’t really panning out. They are much safer living separately and I think we’ve finally accepted that Toby is way too territorial to have a roommate. But, where this leaves Kelly is fairly lonely and missing Toby’s company, even if it meant her feet were going to get bitten off! Enter a new parakeet to hopefully be a new roomie for Kelly and an overall good addition to the flock. Of course as a person who struggles with delaying gratification I would love to go out and snap up a baby boy yesterday! Unfortunately, I have to travel quite a bit for work in the next couple of months, so November is looking like the most responsible time to get a new budgie. We really messed up when we got Kelly by not quarantining her in a separate room from Toby. Not only did we take a huge risk of exposing Toby to disease, but we also took away from ourselves the opportunity to spend one-on-one time boding with Kelly. As a consequence, although she likes us, she doesn’t feel the same sort of connection that Toby does. At the time it seemed much more important that Toby have company immediately, but now we feel that a proper quarantine would have helped. When we get the new parakeet in November we are going to quarantine in the room furthest away from Toby and Kelly’s cages. 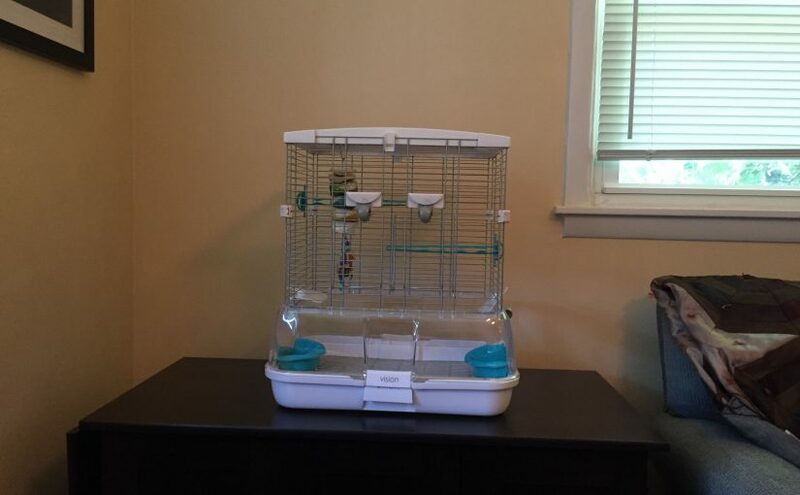 I am not 100% sure whether I’m going to keep him in the Small Vision Bird Cage or the Prevue Park Plaza Bird Cage , the usable space seems about the same to me, assuming the new kid isn’t a ground dweller! That way we’ll have time to make sure he’s healthy, and also spend lots of time bonding and proving how awesome humans are. Side note: is it really bad that I have two parakeets but four cages? I’m similarly unsure where we are going to get him from. I know that we want a boy, and I’m not opposed to getting a mature fellow who needs a new home. At this point I’m thinking we will explore our options and pick whoever “speaks” to us most! We did that with Toby and it worked out really well. I’m also waffling back and forth on whether I want to get him from somewhere that he will come clipped. It didn’t work to our advantage on taming Kelly that she was clipped, but again, primarily because we squandered our chance to bond solo. Anyhow there are some interesting days and shake-ups ahead so stay tuned! 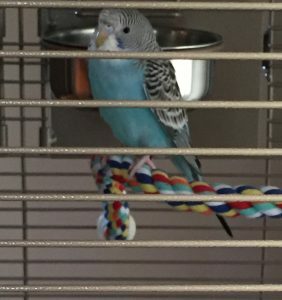 Also, please keep your fingers crossed that this new parakeet will be able to bunk in with Kelly or Toby after quarantine, because I really don’t want to end up taking care of three separate cages! Selecting and bringing home your first parakeet is a very exciting time for your household. 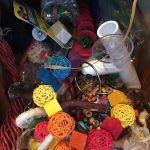 Whether you’ve meticulously planned and curated an awesome cage for him, or you’re winging it and buying everything at once, chances are this isn’t a spur of the moment decision. 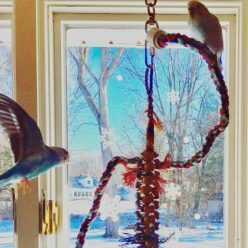 You’ve probably thought a lot about what it will be like to introduce a parakeet to your home. 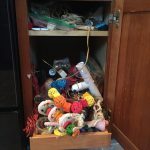 Once you have actually installed the parakeet in his cage, you may be struck by the fact that he seems like a completely different bird than he was in the store, and some of the new behavior can be quite alarming. Here’s what you can expect for the first few days of adjustment. The new parakeet doesn’t move. Literally for hours or even a day or two you may not see your parakeet move at all. Toby stayed stock still for 8 hours when we first brought her home and Kelly did the same. The parakeet is okay, he is just checking out his new environment and he is scared. Being a prey animal, one of his responses to fear is to stay totally still so predators don’t detect his presence. Of course there aren’t any predators in your home, but he doesn’t know that yet! You can play soothing music to help him feel comfortable, and I recommend staying out of his way until he relaxes. You want him to observe your household and make the determination that it’s not so scary after all, and it’s harder for him to do that if you get close or put your hands in the cage and frighten him further. This applies even to parakeets that you would expect to be totally chill about the move, such as hand-fed babies that you may have even met before on several occasions. It is still a HUGE and scary change making a move. The new parakeet doesn’t eat or drink. You may think that the budgie is not eating or drinking anything, even up to 3 or 4 days post introduction into your home. This is likely not the case, he will eat and drink when you are not around and he feels safer. Eating and drinking puts him in a position that’s very vulnerable to attack from predators, and since he’s not totally convinced you aren’t a threat, he will eat and drink when you’re gone. Check to see if there are seed hulls in the food bowl, that’s an indication he is eating while you’re not around. If you are truly concerned put in a spray of millet for a while to see if he will go for that. It may take longer for you to see your parakeet drinking versus eating. It was two solid weeks before I saw Toby drink, but of course she must have been doing it in secret all along. You can also monitor his poops to make sure they are made up of both urates and feces (white and green or brown), although some poop variation is normal due to all the changes and stress. This is not the time to introduce vegetables, fruits or other new foods. the best bet is to provide whatever food your parakeet has been accustomed to eating; you’ll have tons of time down the road to change his diet. The new parakeet doesn’t make a sound. As you might guess, this is also to avoid drawing attention to himself from predators. 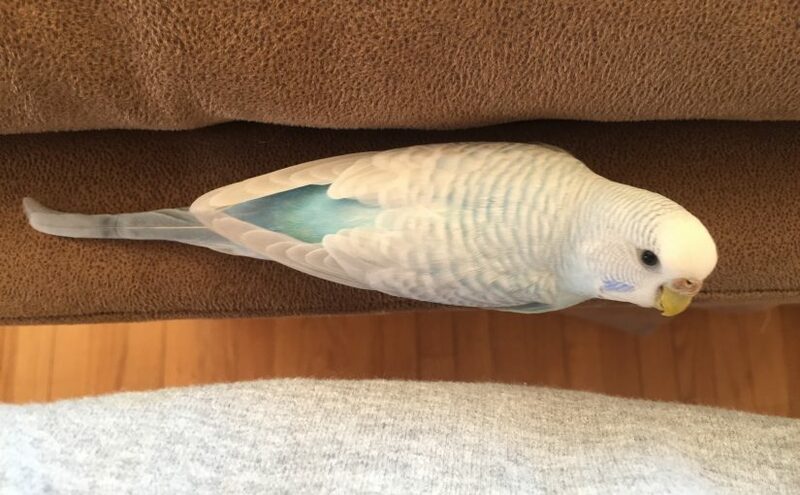 Play music or have the tv on at a reasonable volume and the background noise should help your parakeet feel more comfortable. He’s probably used to lots of noise being in with other parakeets so total quiet without other birds can be very jarring and scary. It may take days before he relaxes enough to start singing, yelling, screeching and making all the other delightful budgie noises! Hopefully that helps explain why the boisterous little clown you picked out at the pet store turned into a quiet parakeet statue the moment you brought him home. It can be a terrible feeling seeing him so scared and out of sorts, but give it a few days and he’ll come around. 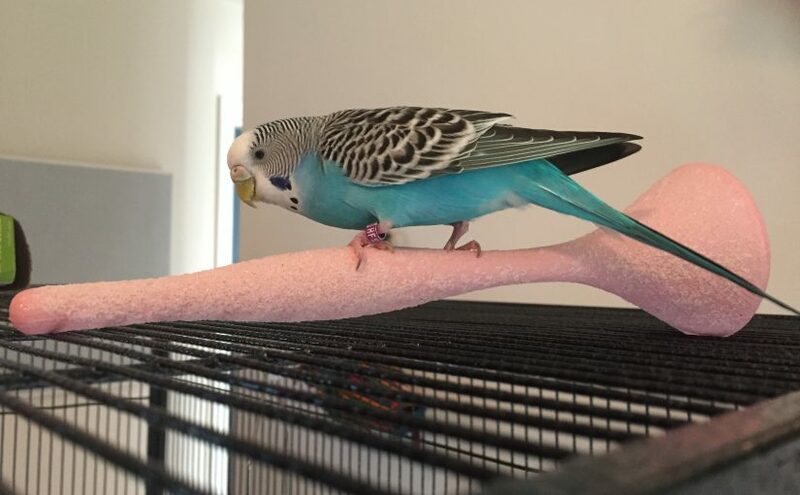 Once your new parakeet has begun moving around and acting more like himself it’s time to begin the taming process, but before that happens I strongly recommend giving him time to settle in and figure out the he’s safe in your home. Before parakeets I had never heard the term Gotcha Day, which means celebrating the day you got a pet instead of the day it was born. This is a cute alternative to celebrating a birthday when you don’t know the date your pet was born. For birds, celebrating their birthday is usually called their Hatch Day instead, or the day they came out of their egg. It’s weird, but even though we got Kelly from a local breeder I don’t know her hatch day. I just never bothered to ask at the time, and it didn’t occur to me until much later that I should have found out so we could celebrate her hatch day properly! We are fast approaching Kelly’s first Gotcha Day and I wanted to take some time to reflect on the past year of her life. When Patrick first picked out Kelly at the RBC she was a couple of weeks older than the rest of her clutch and seemed so calm and composed in comparison to all the little half-feathered babies. We knew we wanted a confident parakeet who didn’t seem afraid of the world the way Toby was, so Kelly looked like a natural fit. We hoped she was a boy but felt that even if she was a girl things would work out. Taking her home was a way different experience than bringing home Toby, who came home in a carboard box. Kelly was riding in style in her Travel Carrier and was curious about everything she saw outside the car window. We were shocked at how fearless she was and how interested in the world. Once she was home she was definitely intimidated by her new surroundings and spent her entire first day motionless on a single perch, but after that she quickly adapted and began doing crazy baby acrobatics in her cage and demanding to be let out very frequently. Which was our first big challenge, not having had a clipped parakeet before we had no idea how much work it would be to keep her safe and help her not be so frustrated when she saw Toby flying every day and couldn’t stay with her. 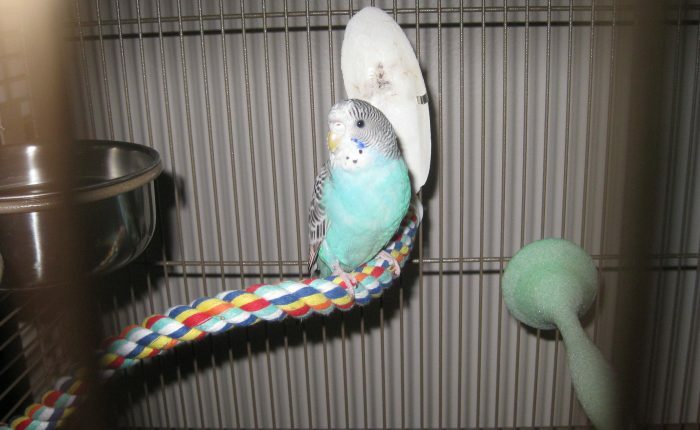 As Kelly matured we realized we had a biting budgie on our hands (literally!). 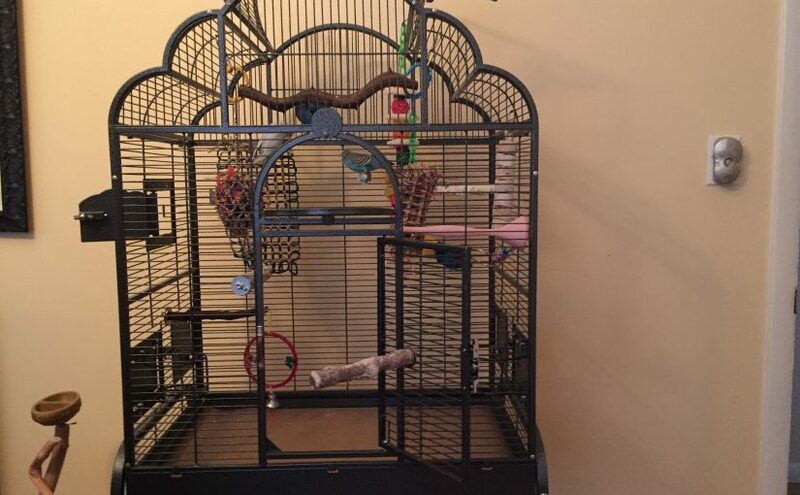 And while we were dealing with her aggressive tendencies we also realized that having a much more adventurous budgie meant making more modifications to the house. So far we’ve protected our dining room table successfully and had to swap around all of our artwork after she became obsessed with chewing wood frames. Coming up I think we’re going to have to change out a ceiling lamp she’s recently taken a shine to, and of course we are still working on the biting. It’s like parents who have the first kid and it’s an angel who stays in one place and is very sweet, and then have a second kid who’s into everything and comes as a total surprise! But, as I always add, there are so many things to love about Kelly that it really outweighs the negatives. Even if it causes me anxiety, I love her adventurous spirit and that she encourages Toby to try new things. I like how great she is at being a parakeet, she keeps her nails and beak in great shape all on her own and even helps me keep the cage clean by picking poops off the bars. She’s a good eater who’s always willing to try something new, and she’s extremely healthy. As much as she likes biting us, she also does enjoy being part of the family. She’s always interested in what we’re doing and wants to be with us, probably more than Toby, who is a bit of a home body. So – a very happy Gotcha Day to Kelly, I’m so glad that she came home with us!